As the old saying goes, cash is king and when times get tough, money gets tight. And when money is more difficult and expensive to borrow, it's especially important for small businesses to take steps to ensure that their cash flows keep flowing. Here are some cash flow management tips help your small business ride out the storm. One of the key factors in weathering any storm is knowing that it's coming and what direction it's moving. Keep an eye on the leading indicators for your business and be aware of changing economic conditions. Prepare cash flow projections for the next year. This will help you to see what changes need to be made and when. If such-and-such happened and your predicted cash flow dropped x%, what could you do? Managing your customers' credit is an important part of cash flow management. Weed out unprofitable customers, those that cost more to maintain than they add to the bottom line. Flag those who have a history of slow payment. It is equally important to perform credit checks on new customers applying for credit. Remember that you do not have to extend credit to anyone. If a customer has a history of slow payment, changing the credit terms or even eliminating credit entirely may be required. If it does become necessary to refuse credit to a customer, make sure this is done as tactfully as possible. After all, you do want to have them as a customer in the future. Send a polite, regretful note informing them that you cannot extend credit at this time and state the reason(s). Make it clear that they are welcome to transact in cash. First, invoice promptly. Putting off invoicing gives the customer the impression that you don't care how long it takes to get your money. Second, take measures to encourage prompt payment, such as clearly stating payment due dates and sending overdue notices. Use collection services when necessary. Getting the money if you can is always better for your cash flow than a bad debt. On the other side of the coin, check on the credit terms that your small business's suppliers allow. Most suppliers allow thirty days to pay but you may be able to get them to extend that term to sixty or even ninety days, allowing you to keep the money in your cash flow pipeline longer. Landlords, lenders, and contractors are not impervious to changing economic conditions so trying to renegotiate is worth a shot. For instance, if the lease on the premises of your bricks-and-mortar business is up, you may be able to negotiate a more favorable rate with your landlord - especially when another retail property is standing empty. A less expensive lease will let you free up more of your cash each month and get more of a cash flow going. There are a number of software tools available to manage, track and forecast your cash flow. If you happen to be using small business accounting software to manage your accounts you may already have the cash flow tools you need. Cloud-based accounting applications such as QuickBooks have built-in cash flow forecasting reports. Others such as Sage One offer add-ons for cash flow management. See 6 Advantages of Using Small Business Accounting Software and Before You Buy Accounting Software for Your Small Business for more information on accounting software. There are also many software products dedicated to cash flow management, forecasting, and budgeting, such as Pulse and Float that can interface directly with popular accounting software products. 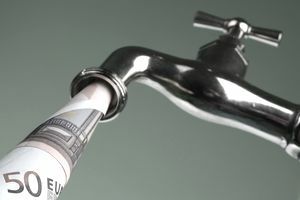 Remember, the outflow part of cash flow is never a problem; money will always run out of your business easily. Keeping the money coming in on a regular, sustained basis is the tricky part of cash flow management. Following the suggestions above will make it easier to keep your cash flow flowing.